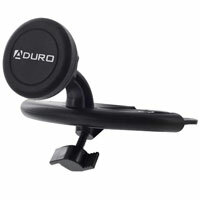 The Aduro U-Grip Magnetic CD Slot Vent Mount is a sturdy, cradle-free device-holding system for most mobile devices. It lets you safely see the device screen while driving and mounts to almost any vehicles CD slots. It has a ball joint adapter allowing it to a have a 360 degree viewing options and fine tuning the angle to your preference.